I built an incredible physique using isometrics, guys like Yarza, and Jarrell did the same and every day I receive grateful emails from those that have transformed their own physiques using the same methods found in 7 Seconds to A Perfect Body...and I am proud. Apparently however others are proud too and certainly impressed with the results my system has achieved. In particular "TOP" personal trainer Jarret James. On his website Jarret James has MY before and after photos. On his website Jarret James claims I got MY results by training with him. On his website Jarret James claims I was his client of the month in April. And On his website Jarret James claims I play professional rugby. THE RESULTS MY PERFECT BODY SYSTEM PRODUCES ARE SOOOOO GOOD OTHER PERSONAL TRAINERS ARE CLAIMING THEM AS THEIR OWN! Can you believe the lies this guy is telling? 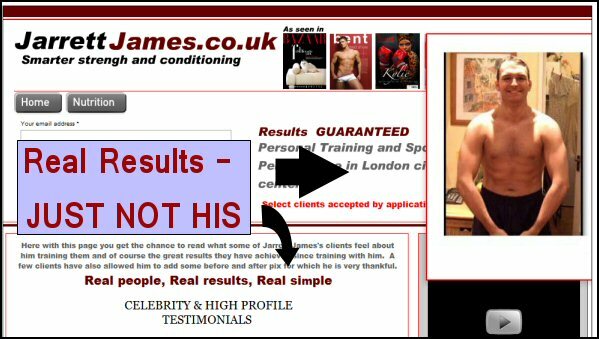 It is clear that Jarret James Personal Trainer IS A FRAUD, and a liar, and a thief. What type of trainer can this man be if he is STEALING his success stories off other people’s websites? 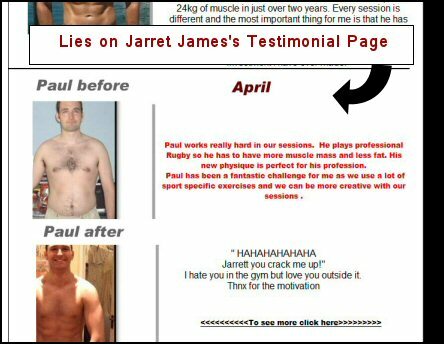 But this raises an important point about the nature of before and after photos on fitness and weight loss websites and while Jarret James Personal Trainer IS A FRAUD and a thief and liar, sadly so too are many other trainers and websites making claims about their products, using photo-shopped images and out-right lying about what their supplements and training programs can do. This is one of the reasons I USE myself as a guinea pig for my programs – I can trust myself, I can see those results first hand. It’s why I post the detailed case studies you can download for free on this website. Each of those is a REAL PERSON. They are REAL DOCUMENTED RESULTS. On my facebook page and in private forums real trainees post and share their experiences and results. I do not have to make up stories. I do not have to lie about what my program can do I DO not post fake photos stolen from other people I post REAL PEOPLE, REAL DEMONSTRATIONS, REAL CLAIMS AND REAL REUSLTS. But even then, I don’t ask you to take my word for it. I ask you to try it, to prove it to yourself on your own body. Build your own results and become your own proof. That’s what I did. That’s what Yarza, Jarell, Catherine, Nic, Steven, John, Tom and the thousands of others who have emailed me, trained with me and used Perfect Body and Project Dragon Project Dragon have done. If you want to see REAL before and after photos, ones YOU CAN BELIEVE – go take a photo of yourself NOW. Start using Perfect Body and get your nutrition sorted. Then in 7 Weeks take another photo of yourself. You can believe those before and afters. You can see and feel those results. And while Jarret James Personal Trainer IS A FRAUD you can look at your own hard, lean, chiselled physique and know the truth.